Historically and traditionally a hugely male dominate sector, there’s no doubt that women are playing an increasingly important role in the haulage industry. Each passing year the Women in Transport category at the Fleet Transport Awards highlights the ever more diverse roles that women undertake, many of them increasingly high profile as they prove that whatever men can do, women can do better. One part of the industry though where female names are still a rare sight is, literally, the name on top of the truck. However if you are in the Kildare / East Leinster region, keep your eyes pinned for a rather smart looking Volvo FM concrete mixer truck bearing the red livery of Hanlon Concrete. This one comes with a rather special difference – the name over the cab is one Eileen Dunne. 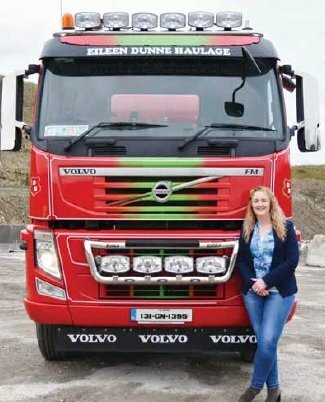 For those in the industry, Eileen is well known as the administrative side of Dunne Haulage, the successful operator based in Kilmeague near Naas, County Kildare. And rest assured, this new 8-wheeler isn’t an indication that Eileen and her husband Damien are going separate ways. Eileen laughs at the suggestion. Or as she nicely puts it – It takes a hard woman to deal with hard stuff ! However, while the concrete mixer bearing her name can be seen traipsing the highways and byways of County Kildare, Eileen is still fully occupied with the administrative side of the family business. That’s family business in the fullest sense. 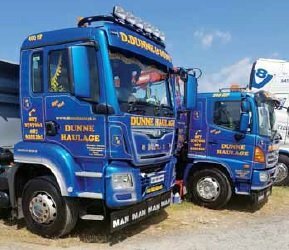 Dunne Haulage isn’t merely a husband and wife team, three generations are doing their part in growing what was a one truck operation into today’s fleet of eight trucks, not to mention a selection of plant machinery including a CAT dozer, mini-diggers, and teleporters. It includes Damien’s father Noel, aka ‘Sugar’, while the next generation comprising 14 year old Damien Junior and 8 year old Ned are fully involved as well. 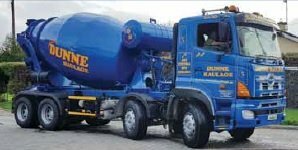 Dunne Haulage started nearly 16 years ago when Damien, after years of working for Roadstone at its Belgard Block Plant in Dublin, purchased his first truck. The acquisition of a second was the cue for his father Noel, himself a trucking veteran of forty years to come on board. From there the fleet has expanded steadily, with the current eight trucks comprising of MAN, Hino and the new Volvo including a mix of tippers, concrete trucks, and a grab ranging in age from 2005 up to a 152 plated MAN. Maintenance is done in-house where possible, with other work outsourced to David Grey, while MAN also look after certain maintenance aspects. That the company sets and achieves high standards is validated by the fact that Damien Dunne twice won the Fleet Transport Owner / Driver Haulier of the Year, in 2013 and 2014. “Probably our commitment to service, to our customers, the relationship that we build with them, and the honesty in what we deliver” – is Eileen’s response when asked what makes Dunne Haulage stand out from the competition: “So the product is what it says it is, we’ll be there when we say we’ll be there, and we charge at what we say we charge. Our customers know that they are getting the best product at the time and that’s what we’ve always tried to achieve and deliver. Once our customers are happy, their customers are happy, and then we are happy – it’s a good combination“. Obviously the fact that the next generation is taking such a keen interest is an incentive to Damien and Eileen to continue to put in the long hours. “What’s in you is in you,” emphasized Eileen, recounting her own childhood time with her grandfather and working in his garage. “From the time I was small I was passing spanners, helping bleed brakes, going for parts, so inevitably it was in me,” she said, noting that the same love for the industry can be seen in Damien Junior and Ned. That enthusiasm was obvious even five years ago at the Fleet Transport Awards in Citywest when Damien Junior, then all of nine years of age, accompanied his father to the stage to collect the second of his Owner / Driver Haulier of the Year awards, and proceeded to confidently tell the assembled crowd that his favourite truck brand was Iveco – much to the delight of the representatives of the Italian manufacturer. Commitment to the local community is quite visible as the Dunnes sponsorship activites include Coil Dubh Hurling Club, Cian Donaghy Bike Racing, Club Kildare GAA, Allen National School and the Winifred Dunne Memorial Cup, which is close their hearts.